At a lonely post somewhere, soldiers are watching. The storm they surely hope never comes. they are our final vestige of democracy. for love of our great nation. They are ready, tense, hard, and confident in duty and task. Sent a prayer to military personnel. 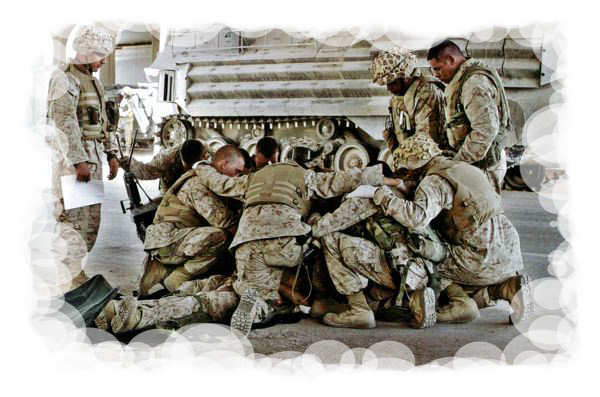 Karen Barber has set up a web site where people from all over the country are posting prayers and inspirational thoughts to encourage our brave service men and women. Karen's family are military people. 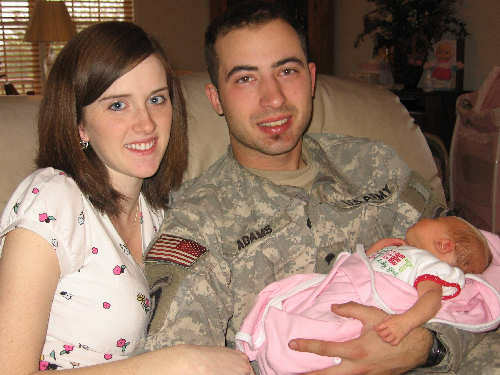 Son, Chris, is serving in Iraq; her husband, Gordon, was an Army lieutenant and son, Jeff, is a former Air force Captain. 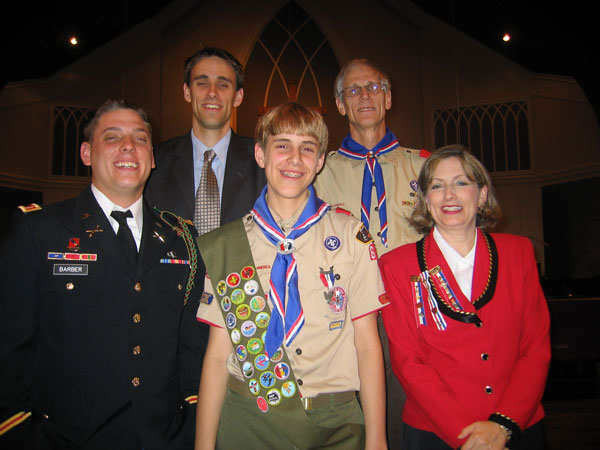 The youngest son, John, is an Eagle Scout. You can read her story in the July issue of Guideposts. If you would like to participate, click on the link below. You can choose a card and an encouraging message to send to our armed forces personnel who are putting their lives on the line for us. Click on the "Let's Say Thanks" link below and follow the directions. Let them know we appreciate their efforts on our behalf. This only takes a moment. Click on the link above and say "Thanks" to the heroic men and women who are taking care of us. When you send the card, take time to talk to God about their safety and success while in unfriendly territory, risking their lives. Thanks for joining in this effort!! My nephew's son, Michael Adams, who has recently been deployed to Iraq. Michael is the son of Philip and Kathy Adams. Michael and his wife, Heather are expecting their first child in a few months. Michael is the grandson of Robert my brother) & Ona Blaine Adams (both recently deceased). You can find more information on Michael and his family at my family website. Kelsey Adams Family, Younger Generation. Mike was supposed to arrive home in time for the birth of his first child, but Emma decided to surprise him and arrive a little early to be there to greet him. She arrived at 3 AM February 21, weighing in at 6.9 pounds and 19 inches 'tall.' She and mom, Heather, were very happy to see Mike who will be home for a few days to get acquainted with his new daugher. Notice how Emma seems to be reaching out for her dad's hand. Cute! 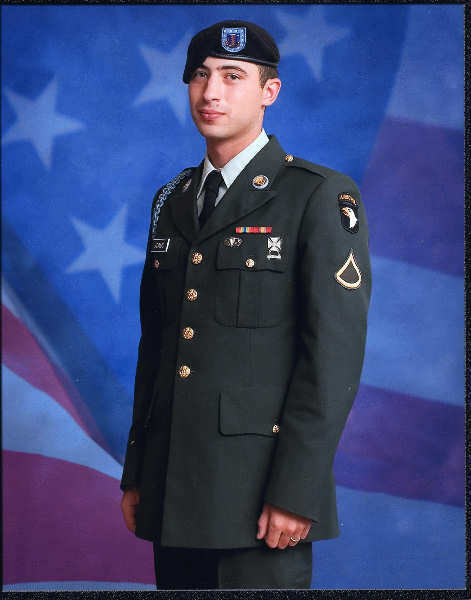 Mike is currently serving with the 1-502 Brigade, B Company. 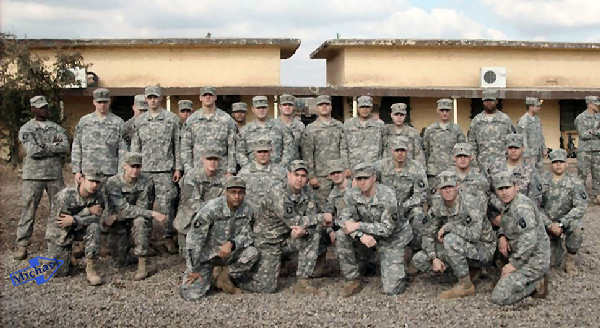 The Company works with Iraqi military and law enforcement. Mike's mom has requested prayer for the safety of Mike and his company who have had some close calls in the dangerous area where they are stationed in Iraq. Please remember Mike and all of our brave armed forces personnel as they stand in front of us in very dangerous situations. Update on Mike. 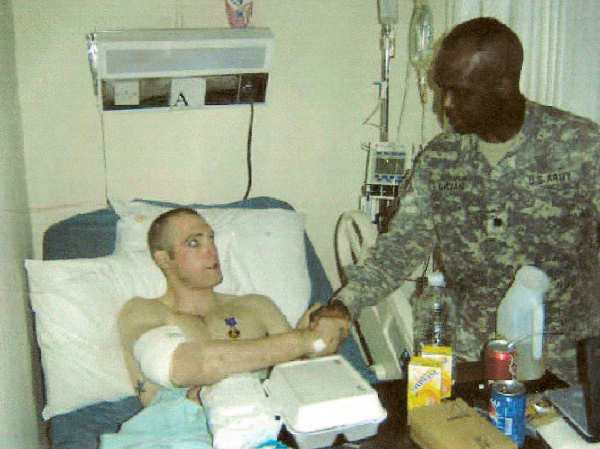 He was able to come home in time for Thanksgiving 2008. He is stationed now at Fort Campbell, Kentucky. His family is most thankful to have him back in the states! Waiting for an update on Mike and family. This information is a few years old now. Click above to send letters, packages, etc. Flash, "If I Die Before You Wake." I just ran across this and thought you might be interested. Dog tags for kids of service men and women. If you find a link doesn't work, please let me know. It might have been a temporary one.